I appologize for this article being posted so late. Life gets in the way sometimes. Chuck reported the sad news that we lost Wally Henry, a member Passed away a couple weeks ago and the club sent flowers to the services. Check went on to talk about being courteous at the field. If you want to do a maiden flight on a busy weekend, you should walk the line and be sure to let everyone know your intentions. That being said, you cant expect everyone to hold up while you try to adjust your airplane. But if everyone tries to stay clear of you and is aware of what your doing, its much better for everyone. Chuck said in March that The Club will not be a traffic cop and ensure your registration with the FAA. This was up to the individual and The Club will only validate AMA. However view is changing in light of some new information revealed in the April Meeting…see the April meeting Notes for updates. Your certificate of registration should be on your person when you fly. You can stick it to your badge. And there very few stipulations on how you label your plane, except to place the label where it can be seen without the aid of tools. So if you have a magnetic hatch, it could be placed in there. 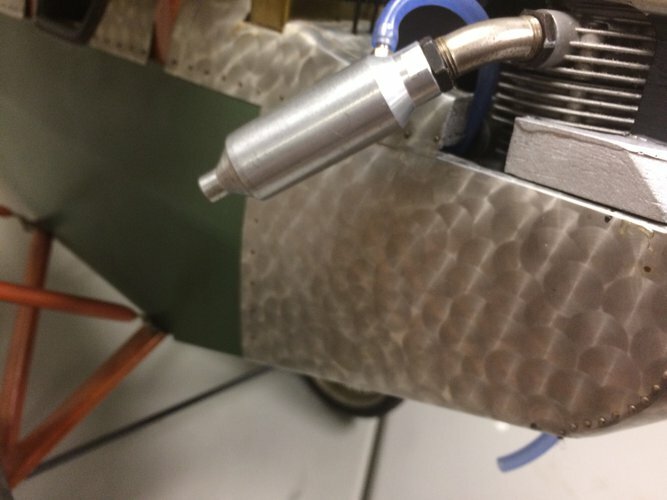 Chuck places his label on the bottom of the plane, and I have been placing mine underneath the horizontal stabilizer using a small clear return address label I printed at home. 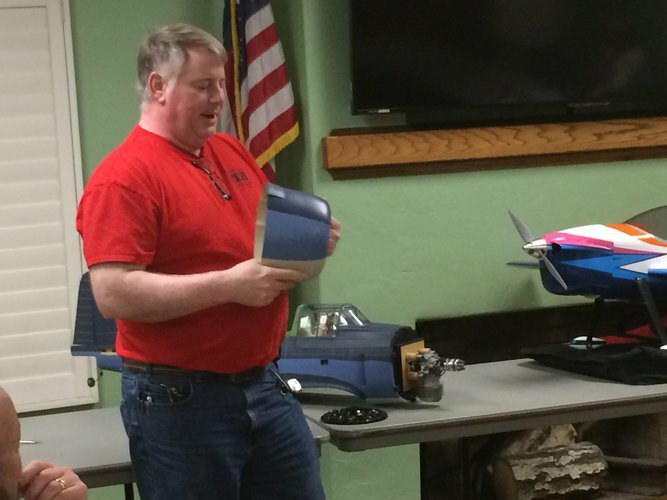 The FAA has registered 300,000+ "pilots" who fly "Drones" , there are only 180,000 AMA members. 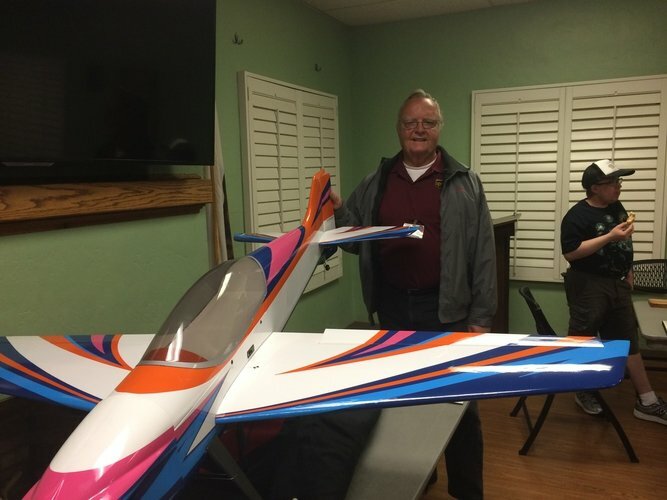 Chuck also spoke with the tower at Chino airport, and informed them that he has asked the club members to Comply and register with the FAA, just so they are aware. Weeds are sprayed at the cost of $2800, and they should be dying soon. We’re getting cleaned up for the summer. They are also going to be fixing a whole at the start of the runway. If you land short …look out. There was a fence broken at the field lying on the side. Ted Novak fixed the fence, but tried to get some help while it was being fixed, and was not able to comply. There is a new huge problem looming due to some changes the AMA intends to make next year regarding registration. AMA has decided that that they will allow members to renew their memberships date to date, not for the calendar year. This means that if new pilot wants to he can Join the AMA in April of this year, and his membership will expire in April of Next year, not on December 31st of this year as it currently does. We have been told this is to bring in more revenue for the AMA, because many pilots wait and get a half-year pro-rated membership, because they cant fly in the winter months in some states because of the snow and cold. Here is the crux of the issue is how to police who is current with the AMA at the field. We can certainly send out automated renewal notices, and we can certainly print out lists of members who are current AMA members. But If you have a 2016 Club badge good until December, and your AMA expires in June, it wont be easy to look down the line at the field and see who is current with the AMA without looking them up in our roster or checking their AMA membership card/number each day. Currently at the field we can easily look down the line and see the badges on the pilot and know that each person wearing this years "yellow" colored badge is current with AMA and Club membership until December 31st of that year. We then only have to check the pilots not wearing a badge which hopefully might be only 1 or 2 a day. Chuck spent 30 minutes with Lawance Tougas, our District X AMA Vice president, to express the problems with this, and he is sympathetic, but offered up no solutions. Chuck also spoke with AMA legal as well as Laura Knowlton who runs the AMA show and runs the Denver club, but was not able to convince them of the issue. At our field there was an unofficial FAA visit by a person claiming to be from the FAA, showing FAA credentials. The person was apparently asking questions about registration to some of the members. He had an ID, and he was there observing the field. He had a generic California plates vehicle, and he said he lives in chino hills but works out of an Arizona office. Tom Marcure has renewed the our AMA Gold leader club and charter with the AMA. Joni Whitsitt made an announcement about the RCX with is this Saturday and Sunday. Scale master qualifier is April 23 and 24th in Gilman Springs. Tom Marcure talked about a documentary on Netflix where called the first air war, where they discuss the evolution of Airplanes during the first world war, and talk to people who are build airplanes in the exact same way they did back then. You can also find it on youtube. Loni Morrison. brought in the sequence 1.20 by great planes. Everyone who is flying AMA Pattern, is now flying electric. No YS gas engines like the days of old. 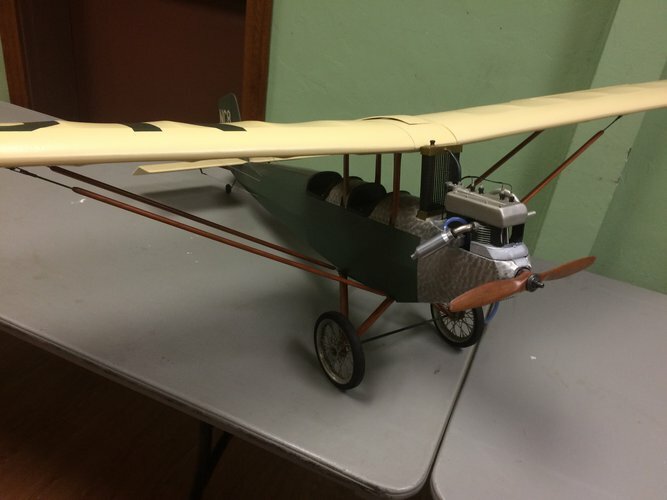 Most planes are composite, but this one is a balsa built up, He had trouble with the cowling and the Tail. It Weighs 11 Lbs. Runs on 6s 5000mah battery and 100 amp ESC. Flies nice and straight. 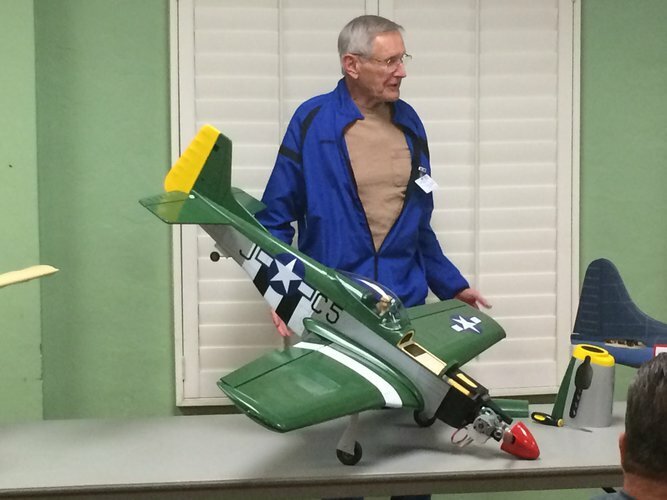 Randy showed and talked about his progress on the Dauntless by VQ models which he equipped with a DLE 30. He had to cut a whole in FW to fit the engine, and realized the wood was not so good, so he reinforced it. He had a muffler from a Moki that will fit nicely. The tail feathers come off for transportation. He is going to a competition up north. The wing is 3 piece and will transport nicely. He is going to cut the cockpit open so that it slides back. It comes with a nice scale rear gunner section. Paul smith brought in his Lady Alice made by VQ models sold at hobby people. He is going to make it a gas model. It has some nice covering. The pilot came loose, so he had to re-glue. He went with fixed gear for now, and they make it easy to pull that out with screws when your ready for retracts. They give you all the hardware, but some of the screws are just not long enough. The cut outs for servos are for small servos not full sized. He was able to get it on sale at a reasonable price. He has a OS 55AX in it. Mark Hibbert brought in a beautiful plane called a Pete /n/ Paul House of Balsa (shown At top & with a close up of cowling detail below. He received the plane in a box, with about 50 pieces. This particular one was originally intended model build for the catalog, and not intended to fly. He added ailerons, painted it. With water base paint, added lettering and coated it with urethane. It’s been good for a couple years. It has a OS 40 4stroke. The details were all included. It took about out 4 months to put together. It has not flown yet. Lonnie Morrison won the 50/50 drawing. We also had 3 new members attend the meeting.